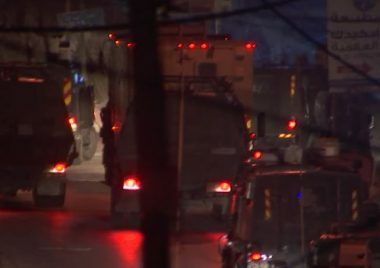 On Tuesday at dawn, dozens of Israeli soldiers invaded the northern West Bank city of Nablus, and surrounding villages, before storming and searching homes, and abducted five Palestinians. The soldiers also invaded Palestinian lands near Nablus, and bulldozed them, in preparation for expanding an illegal colony. Media sources in Nablus, said the soldiers invaded many neighborhoods in the city, and abducted Mohannad Mo’in Tabanja, and Husam Emad al-‘Amoudi, in addition to Islam Anan Bishkar, from the New Askar refugee camp, east of Nablus. They added that the soldiers also invaded Burin village, south of Nablus, and abducted Montaser Khader Najjar, 20. In addition, the soldiers abducted Bara’ Na’el Dweikat, from his home in Rojeeb village, east of Nablus. In related news, the soldiers invaded Palestinian farmlands in the northeastern part of Einabus village, south of Nablus, before the military bulldozers uprooted them in preparation for expanding the illegal Yitzhar colony, which was built on private Palestinian lands. The lands are owned by one Palestinian, identified as Hashem Mustafa Allan, local sources said.